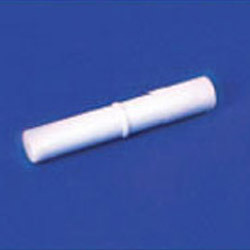 Cylindrical Magnetic Stirring Bar with moulded centre ring contains Alnico V Magnet. Magnets fully encapsulated, leakproof, seamless, polished bars offers excellent centring and smooth running characteristics, universal application. The same can be supplied without pivot ring. Since our commencement, we are engaged in offering Octogonal Magnetic Bar. Our offered range is delivered on-time at the customers' end. The highly experienced team of our company presents PTFE Magnetic Stirrers Bar of fine quality. It is available with a center ring that is used with magnetic stirrers and it comprises of alnico V magnet. This product is fabricated using premium grade raw material procured from known and reliable dealers. We have founded ourselves as a recognized manufacturer of PTFE Magnetic Stirrer Bar. We are pioneer in PTFE Magnetic stirrer bar. We are one of the emerging company offering PTFE Magnetic Stirrer Bar. With the help of adroit team, we present an extensive series of Teflon Cylindrical Magnetic Stirring Bars. Capitalizing over the needs of our customers owing to the huge and up-to-date machine technology with which we are backed with at our company, we have been engrossed in offering with Round Magnetic Stirring Bar with Pivot Ring.